When Christ taught his disciples to pray, He gave them a model: a few lines that have become known as the Lord's Prayer. 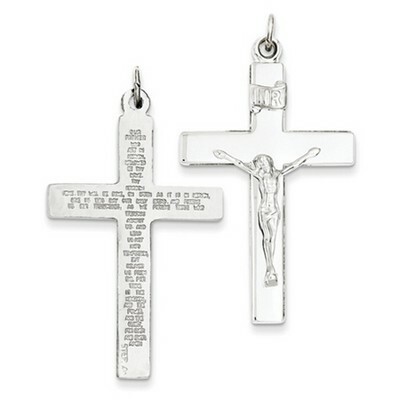 These lines are what make this Lord's Prayer Crucifix Necklace in Sterling Silver stand out from other silver crucifixes. From the front, this gleaming pendant appears to be a fairly traditional crucifix as it depicts the suffering Savior hanging on a simply styled flat cross with sleek lines and clean edges. It's a classic look as it dangles from a slender silver bail. However, when you turn this pendant over, you'll discover that the Lord's Prayer has been engraved with care into the back, allowing you to keep Christ's example of how to pray close to heart. It's the perfect way to remind yourself to stop and say a prayer throughout your day. And, just like the prayer that's engraved into it, this pendant is always appropriate. Cross measures 45mm (1 +") x 28mm (1 1/8") not including the bail. We guarantee our Lord's Prayer Crucifix Necklace in Sterling Silver to be high quality, authentic jewelry, as described above.